Our success is predicated on the satisfaction of our clients and customers. Take a look at what some of our customers had to say. Please leave a review and share your experience with others like you. Brande has been one of the most professional, experienced, kind hearted individuals that my husband and I have ever had the pleasure of working with. She has worked with us throughout our home buying process from beginning to end with true interest in ensuring that this process was a success for us. Brande not only lead us in the right direction but she partnered with other professionals that would show us the same dedication as she has. My husband and I closed on our home after a long drawn out process that was mentally and emotionally draining. Brande encouraged us and helped us throughout it all. I have and will recommend Brande to any and everyone when it comes to the home buying process. She was truly a blessing in disguise. I commend Brande on the her job that’s she does so very well. She puts so much time and passionate in her job and she really cares. I essentially don’t write reviews as Brande well deserved one. This is my second transaction that she has took care of my family and I on. She will take the great care if you. First time home buying has never been so stress free. It was a breeze and went buy really fast. Any and everytime we had a concern, Brande was always there to ease our mind. If I could select two words that describe her work ethics, it would not only be dependable, it would be trustworthy. THANK YOU BRANDE FOR YOUR SUPER WORK! Brande is Truly AMAZING! She made my experience stress-free and her personality and professionalism was phenomenal. She walked me through every step and communicated with me throughout the entire transaction. Her Knowledge and skills are indescribable and not only is she GREAT at what she does she also has GREAT people on her team that she put me in the loop with who also helped with this transaction! Brande was referred to me from a family member that purchased a home through her and they were absolutely right about her! I will forever be GRATEFUL for Brande! When I’m ready to purchase more property I can not see myself working with anyone else but HER!! I just LOVE LOVE LOVE HER!!!! She most definitely deserves more than 5 stars!!!! I have used Centered International Realty to find an apartment twice. Their customer service is second to none. Centered not only found two outstanding apartments for me, they also made the process with my previous landlords hastle free. Whenever I needed documents or information, they responded promptly to my request. I will definitely use Centered International Realty again. We had the pleasure of working with Brande Guilmette-Hampton. Her knowledge of Chicago and the surrounding areas won me over in our first conversation. She was familiar with schools, sports programs, and the cost of living. Brande was patient with us while making sure she moved at a pace that ensured we didn’t miss out on any great opportunities. Brande made herself available at all times for my many questions. Once we found a house, Brande’s attention to detail was impeccable! She was definitely advocating for us throughout the entire process. The business associates she works with showed the same care and attention to detail as she did. Her commitment to us did not end at closing! We received follow-up calls afterwards to ensure everything was going well and that we we still happy with our purchase. I recommend Brande to others because I never once felt like part of a business transaction with her or any of her associates. I felt like I had a team of advocates protecting me and looking out for my best interest as I made a very important decision. This was not my first home buying experience, but it was by far the best! I was referred to this business by a friend who recommended Centered International Realty Corp. He had nothing but good things to say regarding his experience with Centered and after working with the business I agree totally. She had a caring attitude, availability to show property, and assisting with entire process from start to finish. Also the service was excellent and she was very pleasant and always available to show the property. Brande was very knowledgeable and would be a great asset to a first time home buyer. My husband saw a house for sale and decided to call. When we called we were greeted by a very friendly receptionist who provided us with an agent that would be able to assist us in our house journey. We like how we informed our agent that this was our first home and Brande made it a seamless process. She answered all of our questions and made us feel comfortable with the entire process. The 3 benefits of working with this agency is that they are well informed, have great partnership, and they are dedicated to assisting the buyers. I would most definitely recommend this agency to others and say that they are awesome! This has been a great experience for us. Ms. Hay was an invaluable resource helping me recently sell my prior home. Her attention to detail and willingness to go the extra mile to be available, responsive, and assertive, as well as her deliberate awareness of my needs, and her ability to adapt quickly to dynamic situations were very useful and highly valued as she helped facilitate the ideal resolution of what began as a convoluted sale closing process. Sold a Condo home in 2016 for approximately $450K in Lake View, Chicago, IL. Rob did an incredible job listing and selling my condo. He was able to get an offer that I accepted after one day of being listed. I currently live in Ohio and did not have the opportunity to return to Chicago for any of the sale process. It really helped that Rob is a great communicator and is extremely responsive. He took control of the situation and kept me in the loop throughout the entire process. With it being the first time I have sold a property, I had a lot of questions and concerns throughout the process. Rob was able to answer those questions and put my mind at ease. Rob made the process seem too easy to be true. I would definitely recommend Rob and use him as a realtor again if the opportunity presents itself. Sold a Single Family home in 2016 for approximately $375K in Elk Grove Village, IL. Rob helped us through the process of selling our home. He guided us every step of the way. He marketed our home according to its unique qualities to the right people. He didn't simply list pictures on MLS and wait for the calls to come in. Our house sold in record time and for a great price because he knew the market and who would most be interested in our renovated home. He exceeded expectations in every way from the listing to the closing. I highly recommend him for any real estate service In Chaicagoland. Now, he is helping our daughter and her family buy a house. Thanks, Rob. Bought a Condo home in 2016 for approximately $250K in Evanston, IL. Rob is a true class act and a fantastic agent. We met him a little over a year before we closed on our condo, he was representing the seller of a home we liked at the time. When we first got in contact with Rob and saw what we qualified for, we decided that was not the best time to buy a place and put it off for a year. During that time he reached out to us twice to see where we were at, he kept in contact without being overly persistent. When the time came to move forward, we met him at his office and that was the turning point that made us decide to go with him. He clearly outlined the entire buying process which is very overwhelming for first timers. He exhibited patience, professionalism, and courtesy throughout the process. Rob always picked up his phone/texted back. He was always available and you could contact him directly, you didn't have to go through assistants or automated messages. I never heard his voicemail the entire time we were working together! When we found the right place, he was not in our face about making an offer. When we found a place we really liked, he told us to take the rest of the night to talk it over and sleep on it before making a decision. Once we went under contract, he clearly outlined each step and what the next step would be. I always felt like he had our best interest in mind and put that before his commission check. The realtor representing the seller of our place was difficult to work with and downright rude at times, Rob maintained professionalism and respect throughout and was able to keep the deal together. Sold a Single Family home in 2016 for approximately $225K in West Rogers Park, Chicago, IL. Rob was very easy to work with. Provided us lots of data to make an informed decision on the selling price. Then kept us informed on each step of the sale. I would recommend Rob for anyone selling or buying a house. Bought a Multi Family home in 2015 for approximately $300K in Old Town, Chicago, IL. I would first like to say that I will never work with another realtor as long as I am looking in the Chicagoland area. I started my home search online, without a realtor. Rob happened to be the listing agent on the first property that I was interested in looking at. Being a first time home buyer, Rob was patient with me and answered all of the questions that I had about both the property and the process that I was going to be going through in the coming months. Additionally, he provided me with information that I would have never known to ask about or consider when buying a home. That first property was not the right fit for me, but I continued to work with Rob in searches for the right fit. Rob is always timely in his replies, regardless of whether that be through email, text, or phone call, and regardless of the questions being asked. He was always very prompt in getting me in to the properties that I was interested in looking at within a day or two -- and in some cases, that very day. When it came to viewing the properties themselves, Rob was great at pointing out certain things that I may or not be able to do, based on the construction of the building (things such as adding ceiling fans when there is a concrete ceiling). I would recommend everyone I know to use Rob as their future realtor. Bought and sold a Multi Family home in 2015 for approximately $300K in Park West, Chicago, IL. This was the first time we bought a house and the procrocess felt pretty overwhelming. Robs expertise got us through all the steps with ease. We looked a long time for our house as I had it in my head we needed the perfect house. I was sure Rob would get frustrated with me but he reassured me, he wanted us in the perfect house too. He negotiated an amazing deal and we live in our dream house ( which he found us under budget). He was always available for all of my questions and concerns. I felt confident he always had our interest at heart. He also sold our condo which was a sentimental situation. Rob talked us through decisions and the process. He got us a fair deal during a real estate slump and we were very happy with the end results. Rob is someone I would highly recommend to anyone. He is a great agent but more importantly when an opportunity presented itself handled himself with integrity making him a great man as well. Bought a Condo home in 2015 for approximately $275K in Roscoe Village, Chicago, IL. Rob is a true professional and a fantastic agent. We met at an open house when starting our search for a home in the Lakeview neighborhood. He made a great impression with both my wife and I and we called him that week to start looking at homes. Rob is very responsive and not in your face. He will not pressure you to buy and will give trustworthy advice. He wants you to be comfortable and happy and he will provide you with as much information he can about the neighborhood and property. I would without a doubt work with Rob in the future and would highly recommend him to others. Bought a Condo home in 2014 in Arlington Heights, IL. Rob is a class act. From the very first conversation we had, he did not disappoint, his follow-up is impeccable, his sense of urgency is right on target, and he is extremely client-focused. The sellers we were working with were not very flexible and required some perseverance to get to the end of the job. While there were moments I was losing patience, Rob kept us on track and stayed focused on a win-win situation for everyone and this included an unsolicited trip to a city hall to search through dozens of condo blueprints so that my dream kitchen renovation could become a reality. Above and beyond real estate advice, he offered a turnkey solution by introducing me to a mortgage broker and an attorney who both led us to a smooth and timely closing. I cant say I've had a good experience with realtors prior to meeting Rob and am happy to add him to my network so ! that my friends, family, and other connections can benefit from his expertise. 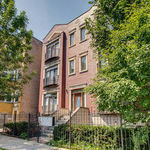 Helped me rent a home in Bucktown, Chicago, IL 60614. With only a month or so notice my company asked me to relocate from San Francisco to Chicago to help open a new office. As soon as I accepted the offer I frantically began my apartment search. After weeks of searching in all the wrong places a friend referred me to @properties and Rob Rosmis and I am so lucky they did! Knowing little about Chicago Rob listened to what I was looking for in an apartment and took me to view each space laying out the pros and cons. When I had finally decided on a place he even took the time to walk around the neighborhood with me to make sure that not only did I like the apartment, but that it was in an area of town where I could see myself living. After finding the right place even the paper process was painless. Rob was extremely responsive and made sure I understood what tasks needed to be completed to secure the apartment. My experience working with Rob to find an apartment was exceptional and I highly recommend him to anyone looking in the Chicago area. Thank you, Rob! I really appreciate all of you work to help me find the perfect place. Bought a Single Family home in 2014 for approximately $325K in Elk Grove Village, IL. We can’t say enough good things about Rob. He helped us find our home in the suburbs. He was great to work with every step of the way. Not only did he listen to what we were saying about our wants and needs, but he read in between the lines and presenting options that were right on point. He also gave great friendly advice and wasn’t shy to share his opinion which helped our decision process. When it came time to put in offers and negotiate, he acted swiftly and professionally ultimately negotiating a great deal on a perfect place. He backed all of his suggestions and market advice up with examples from listings and competitive properties. After the sale, Rob continually stayed in contact to see how things were going. He was not only our real estate agent but is our real estate consultant and friend. We would not hesitate one bit to recommend Rob to anyone looking to buy or sell a property. He definitely knows his stuff! Bought a home in 2014 in Arlington Heights, IL 60005. Rob is a class act. From the very first conversation we had, he did not disappoint --his follow-up is impeccable, his sense of urgency is right on target, and he is extremely client-focused. The sellers we were working with were not very flexible and required some perseverance to get to the end of the job. While there were moments I was losing patience, Rob kept us on track and stayed focused on a win-win situation for everyone and this included an unsolicited trip to a city hall to search through dozens of condo blueprints so that my dream kitchen renovation could become a reality. Above and beyond real estate advice, he offered a turnkey solution by introducing me to a mortgage broker and an attorney who both led us to a smooth and timely closing. I can't say I've had a good experience with realtors prior to meeting Rob and am happy to add him to my network so that my friends, family, and other connections can benefit from his expertise. Bought and sold a Single Family home in 2014 for approximately $400K in Woodridge, IL. Rob Was extremely helpful from his knowledge base to all of his key network connection. He ensured we ware always on task a "virtual wedding planer" for real estate. I love my new house and Rob ensured I never had buyer remorse. Rob Rosmis did an amazing job finding me what I needed in a short amount of time! Could not have asked for a better experience! I would highly recommend Rob to anyone needing a realtor they can trust to find them exactly what they need, when they need it!! Rob was very professional with our move. He knew the area extensively and was always available to answer questions or provide his expertise. Personally, he was just a nice and considerate person to work with during something as stressful as moving. We recommend working with Rob via @properties to find a new home. Helped me rent a Townhouse home in Elk Grove Village, IL. Rob is a professional who is knowledgeable in his field and willing to do whatever it takes to help his clients find a home they'll love. I will definitely be contacting him when I'm ready to purchase a home. I felt that he genuinely cared about the quality of my experience and the home I would be living in. Helped me rent a Condo home in Logan Square, Chicago, IL. I worked with Rob in finding an apartment in Chicago. He did a heat job, I was moving from Boston, and was unable to set up a time to visit Chicago to look at multiple properties, but once I found an apartment I liked, Rob went to the apartment and checked it out for me, took pictures, and was able to describe the neighborhood. I could not be happier with my apartment, location, and everything about it. Rob did a great job, and was extremely flexible. Everything work out great, and I plan on using Rob for future business, and will be recommending him to anyone who asks!